I haven't heard the word "mixer" since I was in my sorority, but Yearn to Learn is hosting a blog mixer so we can learn about new blogs!! My New Kid on the Blog choice is Miss Toffee's Class! She teaches a multiage class (like me) and she is from Scotland. She shares printables and activities, as well as different curricula that she uses in Scotland. I think it is super interesting, and I like to read her blog when she updates it. Since I teach first and second grades, I chose two for blogs on my grade level. For first grade, I looooove First Grade Awesomeness. Mrs. Tabb is amazing! I love her What I Believe section and I hope I can be a workshop teacher like her. You can tell that she doesn't just go with the flow, she teaches her students to the very best of her ability!! So inspiring. 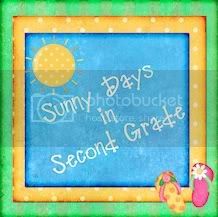 :) For second grade, I chose Sunny Days in Second Grade. Denise seems like SUCH a down-to-earth person, like me! The clip chart she just posted is sooo cute, and I ordered the headers for it as soon as I saw her post! She is super nice too. My favorite blog on another grade level is Miss Kindergarten! Hadar is also super down-to-earth and she has the CUTEST DIY ideas on her blog! I loved her classroom management linky party that she hosted recently - I got tons of good ideas! And I also love her teacher signs on Etsy... I want to get one soon. And lastly, Ms. M has a super cute blog button (and she made mine)! I love the polka dots. Ms. M is very generous and creative! Love her blog. Link up with Yearn to Learn to share your favorites! WOW! Cheers for the comment... I'm surprised but pleased that anyone is interested in my ramblings! I love your blog too :) Thanks for liking mine! lol! This is the best linky party ever! I have only taught one mixed level class and it was a big challenge. I would love to read more blogs about the dynamics in your classes. Thanks for commenting on my blog--that's how I found you!